The global equity markets have begun the year with great rebound, as investors are experiencing the January effect amidst optimism over trade talks between China and US and recent dovish tone from the US Federal Reserve. Similarly, the dawn of a new year signifies a fresh and new start for all of us. After an annual review which helps to slow down the pace of life and allow us to reminisce and appreciate the little and big moments that form part of our lives in 2018, it is now time to embark on new beginnings and resolutions in 2019. As some of us might have experienced, the initial impetus for new year's resolutions usually wanes after the first month and some might eventually bail on their resolutions. Personally, I feel that seeking out support and accountability can help us avoid faltering along the journey. When you share your goals with a buddy or confidante, they can inquire about your progress and root you on. For me, listing out my goals on this blog can make myself accountable to whoever is reading. This form of public declaration can act as psychological tactic to increase the likelihood of sticking to my commitments. 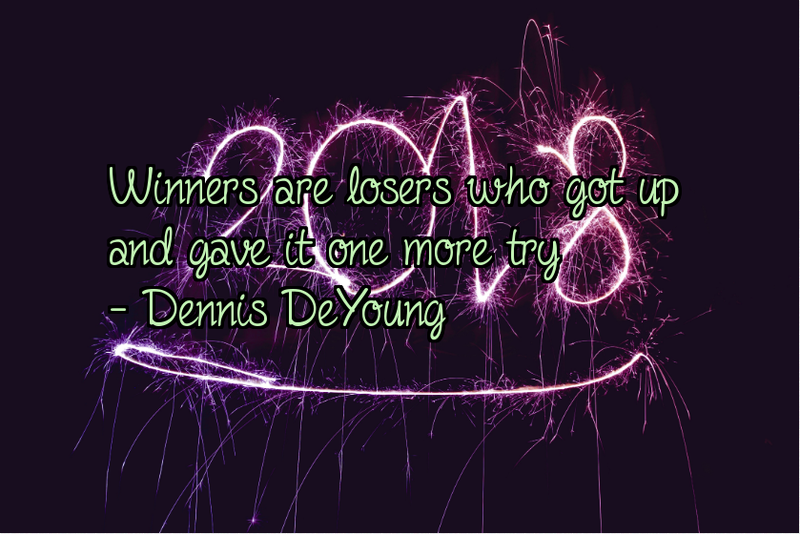 Last year, I have set the targets which I have strived to achieve in that 12 months. And to track the progress, I have conducted a review on these goals in the previous post. To quote The Crown, all men must step into the unknown. And by setting realistic targets, we can seek clarity and precision to navigate in the labyrinth of life and to reach that ultimate achievement. In the context of the blog, that would be to arrive at financial independence eventually. I have been told that the savings and investment goals might be a little contradicting. Therefore, I would probably combine them and aim to save/invest at least $40,000 this year. My 2018 reading progress is largely impeded by the investment classic text, The Intelligent Investor which I personally find it difficult to read due to the dense insight into investing. For 2019, I will still keep the book count at 5 as I have intended to include a challenging book in my list. Initiate on a financial analysis project using either Python / R programming: I would like to keep this target unchanged as it would be good practice for my while I brush up and improve on my computing skills. Blog at least twice a month: In the second year of this blog, I have decided to blog more often and increase the post count per month by 1. As there are other commitments in life that I have to attend to, I do not wish to inflate the post count which might compromise on the post quality. Learn to play a piano piece: Since this has been unfulfilled in 2018, I will keep it unchanged. Keeping my fingers crossed that the digital piano will cease to be a white elephant one day! The completion of a marathon has definitely produced an endorphin rush of accomplishment for me, albeit an arduous process. After the event, I have lost approximately 3kg, likely due to loss of water weight. But even so, I would probably not attempt another long distance running any time soon. I have recently signed up for a 6-months Yoga sessions to complement jogging as part of my fitness regime. This is also to balance out the demands of jogging by stretching out muscles and joints with Yoga being the yin to the running yang. Complete the yoga sessions with 90% - 100% attendance rate. At the end of the day, we should not be afraid to grow slowly but to be afraid only of standing still. Do not underestimate the cumulative power of small and steady changes in your daily routines. Every small change that we make brings us one step closer to becoming the best version of ourselves. With a blink of an eye, 2018 has drew to a close. Time seems to be passing so quickly as we get older. As another year winds down and we forge ahead into 2019, it is the perfect opportunity to pause for a moment and reflect on everything we have experienced and achieved during the past 12 months. One day you will look back and see that all along you have been blooming. The tumultuous 2018 marks one of the most volatile years for the global stock markets, with massive swings in both directions on a frequent basis. The STI too was caught in the market pullback, tumbling a total of 10.54% last year which saw considerably losses in investors' portfolios. Alas, mine was not spared as well. On a personal level, 2018 has been a memorable year for me as I have experienced both good and bad times, the ebb and flow of life i guess. Saying goodbye is part of our everyday lives. But, some farewells can be painful especially when we are bidding the final goodbye which inadvertently leads one to ponder over the fragility and fleeting nature of life. I have bade goodbye to my grandmother last year. Even though she will be sorely missed, I truly believe that she is in a better place with neither pain nor suffering. Earlier in Feb last year, I have shared the goals that I strive to achieve in the post - Soaring in 2018. And now it is timely to look back on the progress of the goals which I have laid out. I have embarked on a new career in 2018 after a hiatus the year before. The assimilation into the new role has been going on smoothly so far and I am thankful for the opportunity that I have been given. 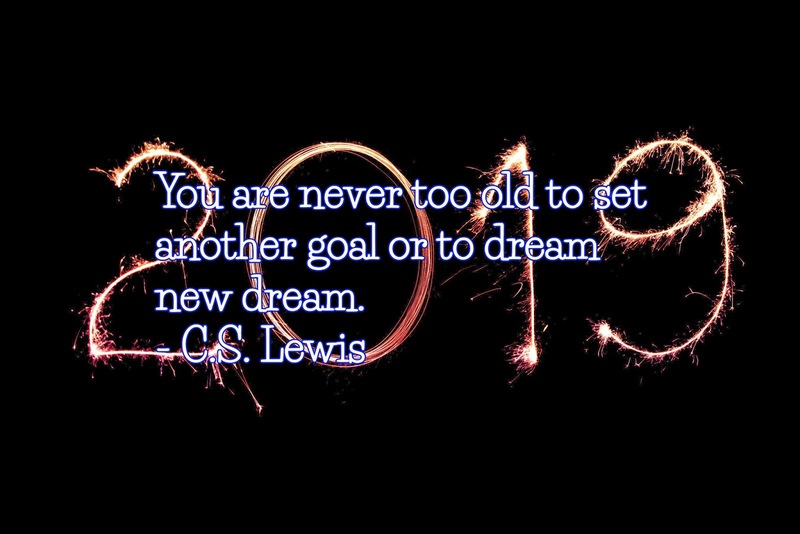 However, I have certainly ended 2018 on the wrong foot and have not fulfilled the first finance target that I have set for myself. To be fair, most of the savings has been placed into stocks and SSBs to form part of the investment portfolio. Be that as it may, I am more inclined towards the accumulation of additional funds for deployment in the event of market correction. As depicted in the chart above, the green bars represent the amount of funds which I have contributed to the portfolio in a given month. The increment in the portfolio value is largely attributed to the capital injection throughout the year. 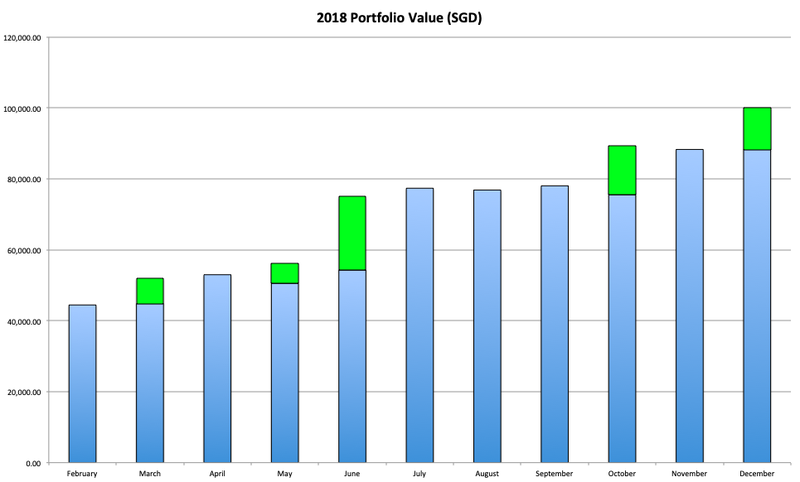 Evidently, I have signficantly increased my portfolio capital by more than $15,000 in 2018. Given the capricious nature of recent financial markets, I certainly hope that I have not been entering at the peak of it. Amidst rising interest rate, I have mainly invested in business trust and REITs. As a practice, I have included reviews and rationales behind making those investment decisions. 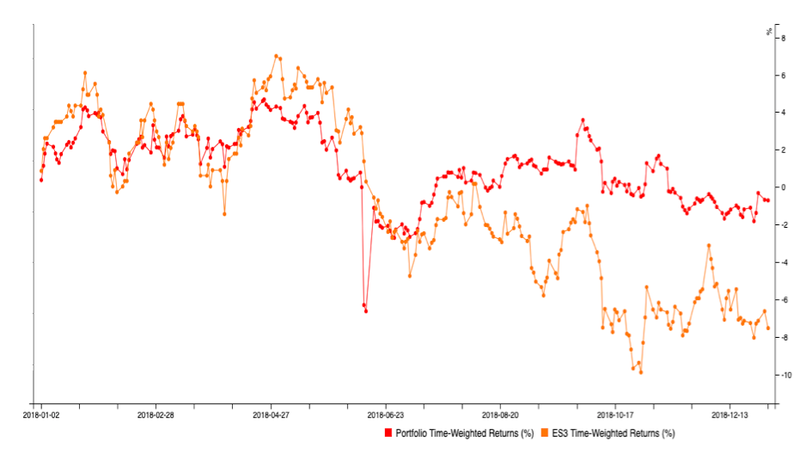 The time-weighted returns of my portfolio for 2018 stands at -0.72% against the backdrop of -6.63% for STI ETF (Courtesy of StocksCafe). Even though my portfolio has exceeded the benchmark by a margain of 5.91%, I felt rather ambivalent regarding this target. It is not how I have envisioned it to be, not in the negative boundary at least. 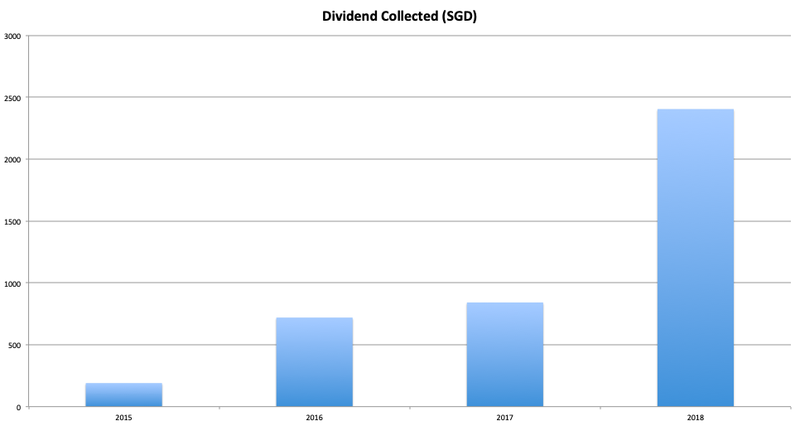 The total dividends collected in 2018 totalized to $2,404.18. By dint of active management of my portfolio last year, I am contented that the growth in dividend fairly commensurate with the efforts put forth. Measuring against my personal goal to reach $500 dividend income per month in 2 years time, my 2018 progress bar is only at 40%. Definitely room for improvement. Despite being a slow reader, I have managed to complete 5 books last year. My book reading progress has largely been delayed by the classic text on value investing - The Intelligent Investor by Benjamin Graham. As the content is somewhat daunting with dense insight into investing, it can be rather demanding to absorb and would require re-reading of several chapters in order to grasp the concept effectively. Maximum Tax Savings Calculator for Shared Parent Relief [using R Shiny]: It computes the maximum tax savings for parent relief shared between 2 claimants. As it is hosted on a free platform, there is a limit on the number of active hours per month. Exploring the Viability of Flipping IPO [using Python Bokeh]: It employs a statistical approach to investigate the viability and profitability of flipping IPO. For those who are interested, I have also put up the codes on the Github page. 2018 is also the significant year which I have started this blog in and I have managed to blog at least once a month. Even though it might not be a demanding goal to begin with, there are times when I have lost motivation to blog amidst busy schedule, especially during the festive period in December. Touted as shoppers and food lovers' paradise, Bangkok is without a doubt, one of the top destinations for Singaporeans. 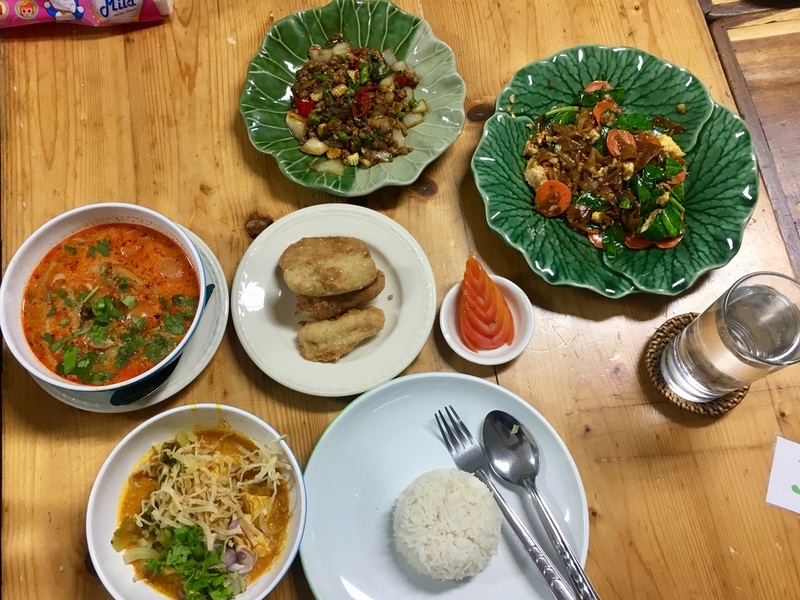 During my vacation trip, I had the opportunity to immerse in a unique Thai cooking experience in this vibrant city. Under the guidance of the teacher, I have managed to whip up some of Thai Cuisine's classic dishes such as the Tom Yum Goong and Pad See Ew. As I am not much of a globetrotter, this was my first time coming across Khao Soi, a Thai coconut-curry noodles soup, and it was surprisingly delectable and flavourful. Overall, there was plenty of hands-on moments during the preparation of the ingredients and the cooking of dishes, including the sculpting of tomato. However, I have not tried to recreate them from the recipes yet. 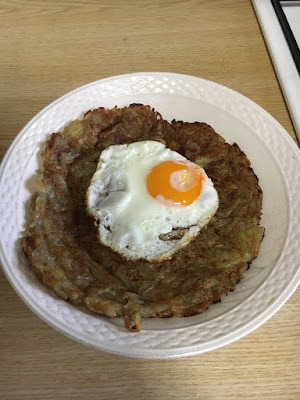 On a separate occasion, I have decided to try my hands on fixing a Rosti due to my craving for the unadulterated form served at Marche. But, the holes on my grater were far too small and it has turned out to resemble that of mashed potato instead of potato strands. Furthermore, the grated potato turned gray when exposed to air due to oxidation (partly because I took up too much time to grate). The final product appeared to be more of a mashed pancake and needless to say, was a far cry from the expected mouth-watering Rosti. The digital piano that I have bought in 2017 has gradually become a white elephant. Even though I have taken a few classes on GarageBand, the lack of consistent practice has made it challenging to make progress on this goal. One of the highlights for me in 2018 is definitely the completion of my first full marathon in December. The timing is probably nothing much to shout about but it will certainly be one of the most memorable experiences for me. You see, I haven't been much of a runner since young and the mere thought of jogging long distance occasionally made me shudder. The mandatory annual IPPT for Singaporean men does not make it any easier with the 2.4km component being the bane of my existence. Nevertheless, deep down in my heart, I was aware that this is not a healthy mindset but procrastination got the better of me. It's the start of the year that I have decided to initiate a regular running regime after settling into my new job. The primary motivation is mainly to break away from the sedentary lifestlye commonly faced by office workers. Over time, it has developed into an evening routine for me. Surprisingly, I even look forward to jogging from time to time as it helps to take my mind off work and serves as an escape from stress. When the moment to sign up for the marathon presented itself, the YOLO mentality must have swept through my mind and I somehow managed to convince myself that I am not going to get any younger and unlikely to be any more robust than I am today. And if I am not going to do it now, then when? There were certain parts of the race route that have proved to be mentally and physically torturous, especially the steep ascent up Benjamin Sheares Bridge at the 38km mark. There was no aid station and no hydration point in sight. Just plain upward slope without end. At that time, I could feel the scorching afternoon sun burning on my back. My legs were gelatinous with fatigue, muscles screaming with pain and my inner thighs stinging from chafing. 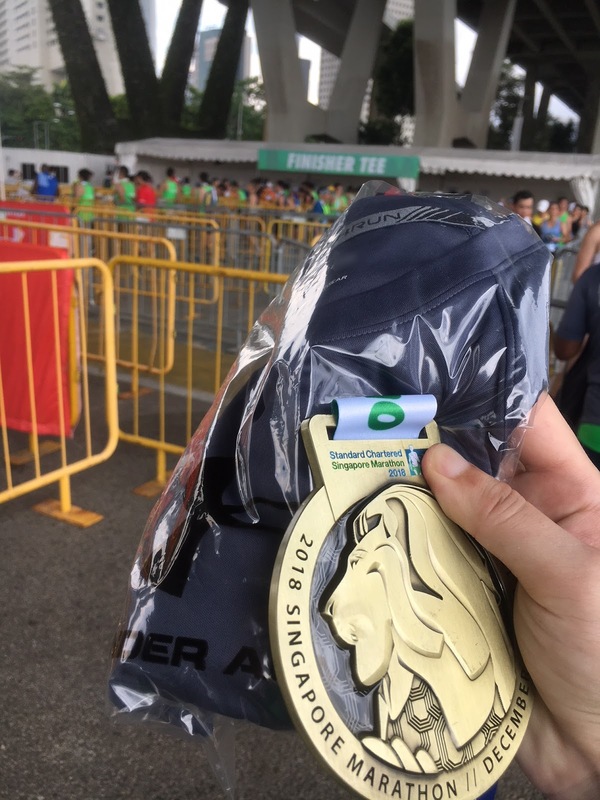 Throughout the race, my mind has wandered off several times and I found myself asking why I was punishing myself when I could linger in my cosy bed on a Sunday morning. Fortunately, occasional bouts of slight drizzle has helped to provide a brief respite from the unforgiving heat.